Adorable little new years babies! They were probably laid starting around New Years, right? Glad to hear the girl is better. Hospital food is indeed an abomination. The salad looks like a welcome antidote. I’ve heard of hens successfully rearing chicks in a free range system, in the dead of winter in my zone (6b), so maybe that hen wasn’t quite so daft as she seems? I would love to have a bantam chick or two, but alas, it’s a bit far to pick up any of yours. Glad to hear your Dd is okay and that you all survived the hospital food and eating out Take plenty of viamin C, rosehip tea is a good source to cleanse the toxins from your bodies. We have hens trying to set and we’re still in the sub zero temps. it’s crazy! Praying they’ll be broody when we want them to set*sigh* I noticed in one of our warm up the turkey hens were allowing the toms to breed them, next thing they’ll be laying eggs, stupid birds. Cute chicks all ’round, yours included. I’m glad all is better. Oh, god, hospitals! Glad to have ’em when we need them, though. What a miserable time, though. It’s -27 this morning in Vermont. Or was. It’s warmed up to -11. So glad your daughter is fine. When I taught, I had a couple of asthmatic students who had attacks in school, and no inhalers, and there’s nothing to do but wait until the parents or the ambulance came to treat them. It’s a helpless feeling. I planning my 1st lettuce mix planting for February. Got the seeds, got the raised bed adjacent to the house for residual heat, will build the “mini-hoop” contraption later this week. 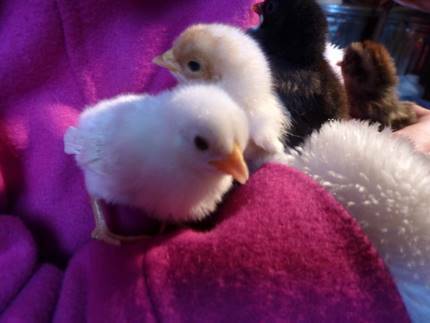 Not ready for chickens yet, but those sure are cute! So sorry to hear about the little one! Six years ago, we were in the hospital for a week with Thing 2 – he was diagnosed with diabetes. I don’t recall much about the food, except that our son ate a ton, and steamed green beans were his favorite. Dh slept in the room, I’d put Thing 1 on the bus and head down for classes and to relieve dh for a while. Thankfully my MIL was there to take care of Thing 1 in the afternoon, I’d come home in the evening, rinse and repeat. We ate fast food a lot then, too. We were so glad to get home and let the real “healing” begin. So glad to hear that your daughter is not letting the diagnosis slow her down. Wow, quite the eventful week, related with your typical elan. All best wishes to “the girl” for fine health ahead. Froot Loops? Now, I used to be addicted to Cap’n Crunch, but even I would draw the line at Froot Loops…. So glad to hear all your chicks are doing well. Sounds like the kind of excitement you can only take in limited doses. It always amazes me that anyone can get better in a hospital what with the pseudo-food and all those sick people everywhere. Poor girl. Hope she recovers from that. Is that allergy related asthma? Careful with the dust in the barn and hay then. Something about the chicken feed…the sheep go crazy for it too and then again the mercury (?) in the feed will kill the sheep…..so I do my share of chasing and yelling. Good thing I dont have neighbors : ). Say hi to the little one. Hope she feels better pronto! I just found your blog a few days ago and I’ve spent way too much time reading through your archives :). I’m so inspired by your posts to become more self sufficient, and I know that I could do a lot better than I currently do on our three acres in Tennessee. I always put out a garden, but I’ve never done much succession planting, so that is what I aspire to this upcoming season. Thanks so much for sharing your successes and failures, I’ll be checking in often! Hospitalized for asthma? OMG. Scary. But you’re such a tough dame, you turn it into a funny story. Best wishes to you all, fowl and human. 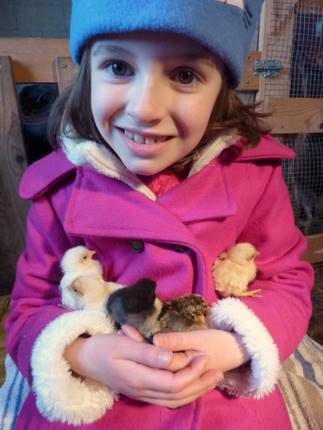 Oh, those are precious chicks and such a cute little miss holding them! What a time you have had! I hope things will settle down to normal now, whatever that is. Heh! Wow, so sorry to hear about last week but very glad to hear that your daughter is feeling better now…that must have been pretty unnerving. I love that picture of your daughter with the little ones…so cute. Got my copy of “The Vegetable Garden” in the mail yesterday…thanks for the recommendation as it looks like a really great book. All I can say is… Aaaaaaw!!! Glad to see your little girl is feeling better, what a terrible way to spend a week. What a great story about the chicks – amazing. Vicariously having chickens through stories I read like this on-line – what fun. Cheers, hope you stay warm and enjoy those little lovelies. Sounds like a stressful week indeed. But glad to know that daughter is well and home – and life exuberant on the homestead…. Glad to hear your daughter is okay and to see her smiling face in the pics again.I was hit by a car first day of summer vacation after 6th grade and spent four months straight in the hospital.I had my parents and aunts and uncles smuggling food into me .I can’t imagine dealing with what your daughter was going through and all those antic farm critters of yours.Best of Luck! Have you heard of Buteyko? It’s a breathing technique that my wife has been using to great effect to control her athsma. She hardly touches her inhalers any more. Glad all is well again. Thank heavens for happy endings. Take care. Wow glad all is well now. Those kiddos give a scare every now and then just to see if we are paying attention. She must be thrilled to have babies in the winter. I bet you have a few roos in the mix to make it more interesting in spring. I had four hatchling the day we left on vacation this summer. We took them with us and kept the chicks in the bathtub. Funny thing I found your site while searching for info on broody chickens a year other two ago. Now hatchlings are old hat wanted or not! Glad your girl is okay. What a good point about hospital food! I wonder if we could mount some kind of field-to-fork program, the way some public schools have, to improve the nutrition with locally grown food. Thanks, All!! She’s doing just fine now. Back to her usual rambunctious self, too. Lisa, yes, indeed: they take around 21 days, so I am sure some were laid before then. Auspicious start on the year! Kate, no, she’s entirely daft. She’s really young. Plus, bantams love to sit eggs. They’re ok mothers but they’re so skittish (mine are anyway) that they pass the trait on to their chicks (big or little). Silkies are supposedly friendly. I worry about their feathers and keeping warm so I don’t keep them. Kelle, thanks! She loves her tea so yeah it’s healing. Turkeys. Our girl is a crazy layer and sitter too…she’s not shown Earl the love lately so hopefully she’ll be smart and wait. JoAnna, good for you about thinking ahead for your planting. And yeah, if having chicks hurried spring along, then I am happy to see them! But yeah, asthma. Grr. Sharon, I think the day you wrote was our first super-cold day of the year, at -1. 🙂 I don’t miss sub-zero temperatures! Ah, Kristie, sorry about the diabetes diagnosis with your boy! And yeah, what is it about hospital food? Our girl had a huge appetite (but mostly for our take-out) and I was so surprised about that. I guess they know what they need. Brett, you’re right, there’s something about the roof-scraping danger of the Cap’n, isn’t there? Bev, yeah, I worried about the germs too but she wasn’t infected by anything. In point of fact, well-meaning relatives were all over us about how long she stayed in there “without antibiotics”! Damn. No fever, no illness, peeps. Instead, it was 6 days of crafting (crochet, sewing, lanyard making and macrame, believe it or (k)not). lizzlee, glad to meet you! You’ll find I am quite the nag about succession planting 😉 but really it’s pretty easy to do and you don’t need as big a garden to do it (less weeding!). I am posting on Monday about garden tips for newbies so maybe there’ll be a takeaway for you too. Hi CC! Thanks. Yeah, why don’t you live closer? You could’ve brought us a steaming Staub pot or two. Or something topped with roe: the girl had caviar on her birthday yesterday and LOVED it. Ilene, yeah, I expect the chick madness a little later in the season, hah! Thanks. Things are feeling “normal” for winter now. Glad you got the book, Mike. The only thing about it is it made me sad to see how few veg varieties in it are still around. Oh and it turned me on to Good King Henry so I guess take it with a grain of salt!! Thanks, Suzy! Vicarious, hah. I will say their poop is good for the garden and they of course make some lovely eggs…hinthint. Serina, hah! Indeed, June is just about right. And yeah, it’ll teach me (remind me, rather) to keep a better eye on those dingdang goats! Love them, but they’re sneaky. Wow, John, what a bummer for both you and your poor parents. I guess we know now to really be vigilant. But ick, hospital food; I have the shivers thinking about it. Peter, thanks, I hadn’t, at least by name. I had a wacky advisor in grad school who was into breathing techniques (odd, considering he smoked) and the only thing he really taught me was to breathe deeply through my nose and I do, mainly so I don’t lose my temper. (It helps.) And I guess I am learning that if you’re asthmatic you should never have to use your inhaler: it’s rescue only. Trouble was, my asthmatic husband’s inhaler didn’t work, so off to the ER we went at 3:00a.m. Thank you, Pamela! hope you’re well too. Beth, glad to meet you too! Wow, chicks in the bathtub, what a fun vacation 🙂 And yeah, the poor baby. I mean myself of course (hah!) because the real baby is just fine! Zev, yeah, interesting, isn’t it? 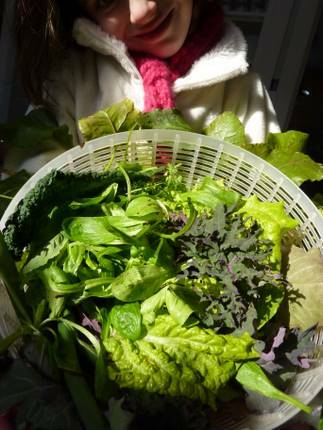 However there are some smart hospital administrators: in Bronson Methodist in Kalamazoo, they source local farmers’ goodies AND sponsor an indoor farmers’ market in the winter. And at Hennepin County Med. Center in Minneapolis (where our daughter was born) they have rooftop gardens. So it’s happening, albeit slowly. Not fast enough for our stay though!